Charles Masterman was born at Rotherfield Hall, Sussex in 1873. He was educated at Christ College, where he became President of the Cambridge University Union in 1896. While he was at university he edited Granta and later contributed articles to newspapers and journals such as the Daily News, Athenaeum and the Nation. Influenced by the teaching of Henry Scott Holland, Masterman became an active member of the Christian Social Union. In April, 1890, Masterman moved into a tenement block in Camberwell in London, in order to experience working-class life. This provided the material for his book, From the Abyss (1902). 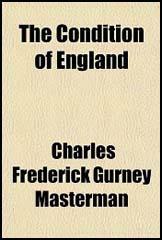 In Peril of Change (1905) and The Condition of England (1909), Masterman continued to explore the changing social conditions of Britain. Masterman was selected as the Liberal candidate for West Ham North and won the seat in the 1906 General Election. Masterman was an impressive member of the House of Commons and in 1908 Herbert Asquith appointed him as the government's Parliamentary Secretary of the Local Government Board. This was followed by periods as Under-Secretary of State of the Home Office (July 1909 - February 1912) and Financial Secretary to the Treasury (February 1912 - February 1914). After the outbreak of the First World War Masterman was appointed head of the government's War Propaganda Bureau. Masterman recruited talented writers such as John Buchan and Arthur Conan Doyle to help him with his work. Several books were published such as Britain's War By Land (1915), History of the War (1916) and The Battle of the Somme (1916). 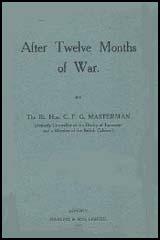 More than 2 million books and other publications in seventeen languages were published in the first two years of the war, almost entirely without the readers' knowledge that these were sponsored by the British government. Only two photographers, both army officers, were allowed to take pictures of the Western Front. The penalty for anyone else caught taking a photograph at the front was the firing squad. Masterman was aware that the right sort of pictures would help the war effort. In May 1916 Masterman recruited the artist, Muirhead Bone. He was sent to France and by October had produced 150 drawings of the war. Published in the national newspapers, the venture was such a success that Masterman arranged for a whole team of artists to visit France. Over the next two years over ninety artists went to the Western Front including Eric Kennington, Francis Dodd, William Orpen, Paul Nash, John Nash, C. R. W. Nevinson, Henry Lamb, William Rothenstein, Wyndham Lewis, John Sargent, Stanley Spencer, Augustus John, Gilbert Ledward and Charles Jagger. In February 1917, following a report prepared by Robert Donald, editor of The Daily Chronicle, the new prime minister, David Lloyd George, appointed John Buchan as director of information, with a department of four sections, including Masterman's at Wellington House. This was a demotion for Masterman: his salary was reduced and Wellington House now dealt only with printed materials, photographs, and the works of war artists, which Masterman had been instrumental in commissioning. Masterman refused to support the Lloyd George coalition government and he was defeated in the 1918 General Election, Masterman remained without a seat in the House of Commons until elected for Rusholme, Manchester, in the 1923 General Election. However, he was defeated in the 1924 General Election. According to his biographer, H.C.G. Matthew: "In his later years Masterman's health declined. He always suffered acutely in the summer from hay fever, but other, undisclosed, troubles afflicted him, including excessive drinking. He died in a nursing home, Bowden House, Harrow, on 17 November 1927."